The running mate to late Abubakar Audu, the candidate of the All Progressives Congress in Saturday’s governorship election in Kogi State, has asked the Independent National Electoral Commission, INEC, to declare him governor elect. 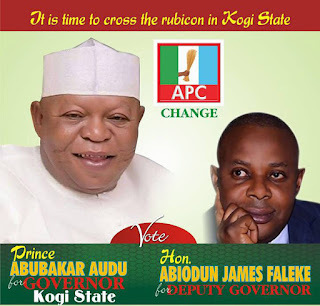 James Faleke, in a November 26 letter to INEC Chairman, Mahmood Yakubu, insisted that under Section 187 of the 1999 Constitution, he was duly elected as deputy governor of Kogi State. While expressing sadness over the demise of his principal, Abubakar Audu, the deputy governorship candidate said INEC had no right under the law to declare the election inconclusive. He accused INEC of deliberately creating what he called “legal conundrum” and urged the APC not to be a party to the action. “In law and logic, no new candidate can inherit or be a beneficiary of the votes already cast, counted and declared by INEC before that candidate was nominated and purportedly sponsored,” Mr. Faleke wrote through his counsel, Wole Olanipekun. In another letter to APC Chairman, John Oyegun, Mr. Faleke urged his party to distance itself from the “Greek Gift” being offered to it to nominate a new candidate for a planned supplementary election in 91 polling units. He said the election had already being won and lost, and that the party should rather support him in actualizing the mandate already given to APC and its candidates.